Buyer Beware: Cheap Price Pool Dealers! 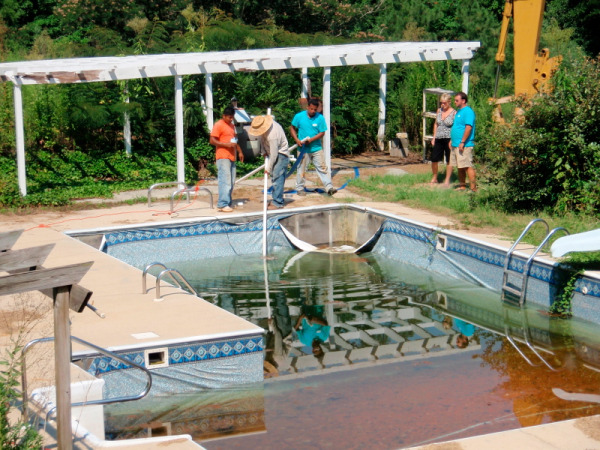 There are three different options when buying a swimming pool: Fiberglass, Vinyl, and Gunite. This statement is true but you also have a fourth option that is the most important one of all when building a swimming pool, The Contractor. We at Earl's Pools specialize in the installation of fiberglass swimming pools, because we believe that they are the best pool offered to consumers. Not all fiberglass pools are created equal so do your research because the manufacturers of fiberglass pools across the nation have different practices when it comes to the making of a fiberglass pool. There are a lot of pool dealers that believe the only way they can sell a pool is by being the cheapest. This doesn't require any selling knowledge of their product but only that they can install a pool cheaper than anyone else. There are a couple of major reasons they can accomplish this. One, they sell a cheap pool that is manufactured with lower standards on the materials used to make the pool in uncontrolled work environments. With fiberglass pools, they are mostly made up of resin and with anything there are different grades of resin that can be used to manufacture the pool. The lower the grade the cheaper cost to manufacture, so the cheaper the pool is to buy. Two, the contractor cuts corners during installation. This can be seen by a contractor using something as backfill that has no place around a swimming pool, like sand or even the dirt that is excavated from the hole. They may also skimp when it comes to the pipe or pipe fittings that may be used underground that the consumer may never see. They may also cut costs by installing a lower grade filter, pump, lights, salt chlorinator, or automatic cleaner; or they may charge you later for some of these items that aren't included in the initial quote. Some contractors elect to get the pools they install outfitted from the factory with the skimmer, returns, maindrains, and even perimeter tile because of their lack of experience of installing or pure laziness of not wanting to do it themselves. During the shipment of the pool any of the fittings may be jarred loose and cause a leak that may be undetected until months after the installation is complete. Installing an inground pool is not cheap. Quality is much better than cheap. When people invest their hard earned money in a pool project they want to be sure they can trust their dealer to use the the best pool and best materials to construct their backyard paradise. Don't be afraid to ask questions about the construction of the pool and the process of installation used by different dealers. Check out the dealer by checking references, insurance, and license. Feel secure in knowing the installer you decide to use will be using the best pool and materials available for your installation.